One of the biggest buzzwords for marketers over the past several years is personalization. While personalization provides marketers and content experience owners the opportunity to drive their customer experience, personalization is still very much a struggle and still very much misunderstood. 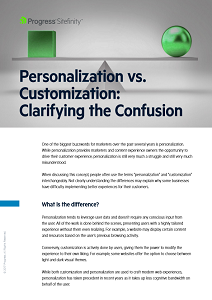 When discussing this concept, people often use the terms “personalization” and “customization” interchangeably. Not clearly understanding the differences may explain why some businesseshave difficulty implementing better experiences for their customers.